The third book in the Crimson Five series releases later this summer and just when I was getting used to that idea, I see we have a cover! And oh my gosh, I don’t have the words to tell you how much I love it. The scene, the colors, the stars…all of it! Gabrielle Esposito designed this one too and I think it’s stunning. I hope you love it too! I have news to share that I’ve been holding in for so long…I think I may burst! My third book is going to be published!! POP THE BRONZE BALLOON, the next book in the Crimson Five series, is floating into the world in 2019. One last intricate task, a new surprising setting, and so many more incredible inventions from my favorite creative kids! I can’t wait to share this story with all of you! What a way to end the year! I am stunned to announce that Spin the Golden Light Bulb has been named by the Children’s Book Council and the National Science Teacher’s Association to their 2019 Best STEM Books K-12 list! I’m grateful, thrilled, and humbled to see my first published book mentioned as one that encourages innovation in children and furthers the STEM education initiative. Reviews of all the books listed will be available from the NSTA in early 2019. For details and the press release, click here and here. It’s here! It’s here! Flip the Silver Switch is here! The sequel to Spin the Golden Light Bulb is now a published book and I can’t wait for you to read the rest of the story. The Crimson Five kids are on a new futuristic STEM + adventure, this time in Quebec. If you like fun, invention-filled settings, friendship challenges, and characters who think more, work hard, and dream big against all odds, give it a read. I have a feeling you’ll be inspired to follow your own big dreams too! Not so fast! Publishing is a finicky industry…Flip the Silver Switch has a new release date. So, you guys will have to wait a little longer to read my precious second baby. The new date is August 21st! It’s still enough time for you to read before the end of the summer though, or add it to your Fall list! Since Flip the Silver Switch is set 53 years in the future, I thought it would be fun to debut the book trailer 53 days from release day! It’s short but sweet and I love it so much…Enjoy! Guys! Today marks 5 months from release day (oh my gosh that’s so soon!) and my second middle grade book has a cover, a spectacular cover…and what is even happening? Not too long ago I spent each and every day wishing that my story about The Crimson Five kids would be published. Now today, the second book in the series has the most beautiful cover I’ve ever seen! Maybe I’m being melodramatic but I really love this moonlit cover more than I can say! 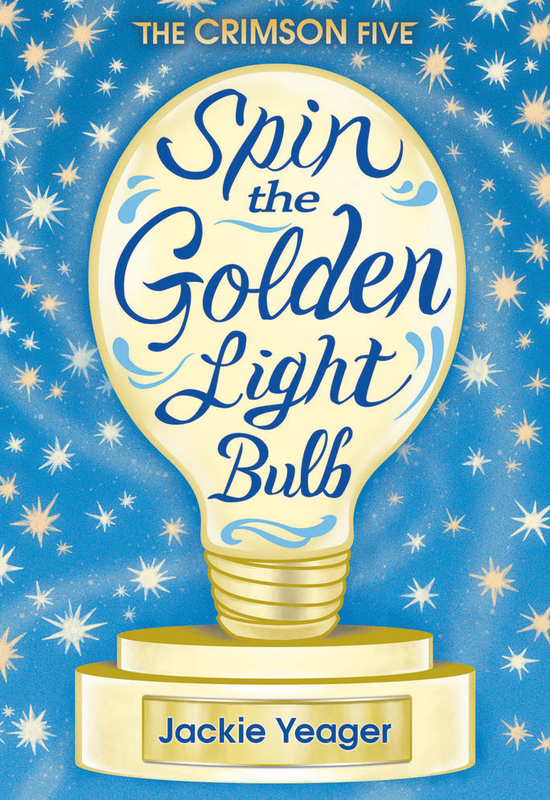 It’s Debut Day and SPIN THE GOLDEN LIGHT BULB is here! *Squee!! * Here I am holding the hardcover and seeing it at Barnes & Noble for the first time. New Year, new update and now the countdown is in days, not weeks! Spin the Golden Light Bulb debuts on January 9th! I’ve been around the blog-osphere doing some fun interviews with lovely bloggers and also my publisher! For the inside scoop on my writing, and more specifically, the writing of my middle grade book, check a few of them out. There will be more to come in the next few days too. And in more fun news, look at this adorable mug my sweet daughter had made for me for Christmas. In my wildest dreams, I never imagined that someday I’d be drinking from a mug with my book cover on it! If you’re thinking I cried when she gave it to me, you would be right. Like a baby! 1 month. Just one more month until release day! Oh my snickerdoodles, it’s getting close!! Did you guys miss your chance to enter my ARC Giveaway on Twitter? Well, no worries because Amberjack Publishing is hosting a giveaway on Goodreads for FIVE ARC copies of Spin the Golden Light Bulb right now! So you should enter. It’s kind of fun having access to a book before everyone else. If you win, you’ll feel like you belong to a special club! And here’s a pretty picture of my ARC copies…they look just like the one you could have in your middle grade collection too! But of course if you’d rather pre-order a copy, that’s totally fine too! Click on the Home page for all the pre-order links. And if you do, thank you so so much! 2 months, Guys!! 2 months from pub date and the book trailer, well actually the book trailers, for Spin the Golden Light Bulb are live. So, click on the home page (or my blog post from Nov. 7th) and watch…take a peek inside the pages! I hope you love both the trailers. I absolutely loved making them! Enjoy! Andddd…in case you’re interested, there’s an ARC Giveaway for Spin the Golden Light Bulb happening on Twitter all this week, from today until November 16th at midnight. Head on over. All you have to do is follow me (if you aren’t already) and retweet my ARC Giveaway tweet. You’ll be automatically entered to win a signed advanced copy! Here’s me with the ARC, grinning, because I’d love for you to win it! Spin the Golden Light Bulb is 3 months away from it’s release. Yippee!!!!!! I have nothing else to say except if you’d like to pre-order it (for yourself or some sweet middle schooler in your life) that would make me so happy! Spin the Golden Light Bulb has a new publication date! Most authors freak out when their book gets pushed back, but not me. My new pub date gives us a little breather after the holidays to give my book baby the grand welcome into the world that it deserves. So mark your calendars. The first of THE CRIMSON FIVE books will release on January 9, 2018…just one week after it’s original pub date. Oh my gosh guys, it’s almost time to start counting down the days! If I had known this would be THE picture of me with my book (even in ARC form) I would have prepared a little better-at least matching nail polish or something! But at least I’ve color coordinated:) Here are the links so you can pre-order from Amazon, Barnes and Noble, your favorite independent bookstore, or from the publisher directly. Oh my gosh, I sound like a commercial. What is even happening?? 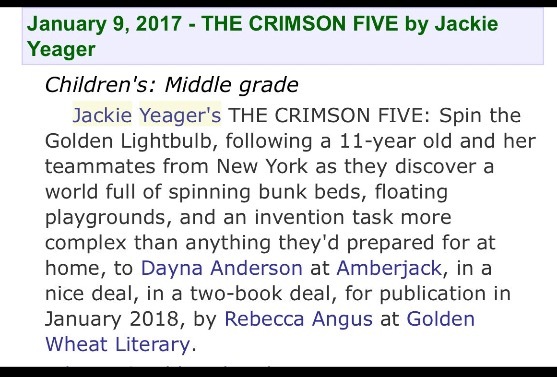 My debut middle grade novel, Spin the Golden Light Bulb has a release date…one year from today!! It’s the first of two (so far!) planned books in THE CRIMSON FIVE series. Stay tuned for more updates. Until then, here’s a screen shot of the announcement that appeared in Publisher’s Marketplace. And if this is a dream don’t wake me. Please!